Some researchers believe that the solar cycle influences global climate changes. They attribute recent warming trends to cyclic variation. Skeptics, though, argue that there’s little hard evidence of a solar hand in recent climate changes. Now, a new research report from a surprising source may help to lay this skepticism to rest. 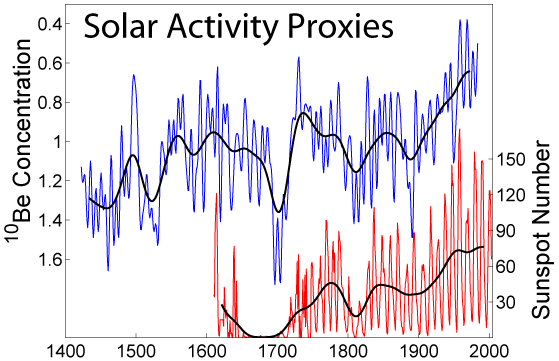 Solar activity has shown a major spike in the twentieth century, corresponding to global warming. This cyclic variation was acknowledged by a recent NASA study, which reviewed a great deal of past climate data. A study from NASA’s Goddard Space Flight Center in Greenbelt, Maryland looking at climate data over the past century has concluded that solar variation has made a significant impact on the Earth’s climate. The report concludes that evidence for climate changes based on solar radiation can be traced back as far as the Industrial Revolution. Past studies have shown that sunspot numbers correspond to warming or cooling trends. The twentieth century has featured heightened activity, indicating a warming trend. According to the study, during periods of solar quiet, 1,361 watts per square meter of solar energy reaches Earth’s outermost atmosphere. Periods of more intense activity brought 1.4 watts per square meter (0.1 percent) more energy. While the NASA study acknowledged the sun’s influence on warming and cooling patterns, it then went badly off the tracks. Ignoring its own evidence, it returned to an argument that man had replaced the sun as the cause current warming patterns. Like many studies, this conclusion was based less on hard data and more on questionable correlations and inaccurate modeling techniques. The inconvertible fact, here is that even NASA’s own study acknowledges that solar variation has caused climate change in the past. And even the study’s members, mostly ardent supports of AGW theory, acknowledge that the sun may play a significant role in future climate changes. That the sun affects climate has been known for years. That the sun has shown no long term warming trend since the 1950’s has also been known for years. This is why so many studies have concluded that the sun’s contribution to global warming over the past 30 years has been minimal. If anything, the sun has been slightly cooling. John Cook: your forgetting ( as many have ) that there is a good deal of delay between the solar maximum and the Earth’s *average* temperature rise. You can thank the enormous ocean coverage for that. Currently, we are now seeing the effects of the cooler sun with cooler temperatures – on average. We can expect a few more years of cooling. And then, we need to concern ourselves with thermal conductivity of CO2 versus, say, water vapor. CO2 conducts twice as well as water vapor, meaning the effect it has is to allow greater fluctuation between night/day, whereas water vapor mitigates that effect. ( remember, if it keeps heat in, it keeps heat out – with almost equal effect ). The second issue is that water vapor is FAR more abundant in the atmosphere than CO2 ( we measure water in percent, whereas CO2 in part per million ), giving it the much greater effect. And then man-kind contributes only about 4% to total CO2 output, but our farming may well make that a bit of a moot point. oops.. CO2 isn’t more conductive, it is more capacitive – but my point remains valid.